Beutisa Anti-Wrinkle Day Cream has been formulated to instantly reduce fine lines & wrinkles and improve the skin’s texture to reveal a youthful radiant glow. Our cream protects the skin against photo ageing, which can cause wrinkles and premature ageing. Beautiful smooth and supple skin. Beutisa Anti-Wrinkle Night Cream has been formulated to remove wrinkles, nourish and regenerate your skin. Our strong Anti-Wrinkle formula removes fine lines and wrinkles while you sleep. With regular use, it will gradually eliminate wrinkles and fine lines, equalize skin tones, and brighten complexion. Wake up to soft and beautiful skin every day. Replenishes skin at night and supports its ability to regenerate. Beutisa Papaya Cream is an effective moisturizer which contains 100% natural Papaya extracts. Our cream penetrates the skin to moisturize from within and aids in firming the skin`s texture and tone. Our quick absorbing formula helps replenish lost moisture leaving your skin feeling soft and silky smooth. 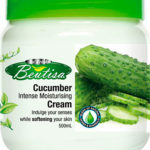 Beutisa Cucumber Cream is an effective moisturizer which contains 100% natural Cucumber extracts. Our cream penetrates the skin to moisturize from within and aids in firming the skin`s texture and tone. Our quick absorbing formula helps replenish lost moisture leaving your skin feeling soft and silky smooth. 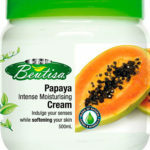 Beutisa Papaya Cream is an effective moisturizer which contains 100% natural Papaya extracts. Our cream penetrates the skin to moisturize from within and aids in firming the skin`s texture and tone. Our quick absorbing formula helps replenish lost moisture leaving your skin feeling soft and silky smooth. Beutisa Lemon Detoxifying Scrub is formulated to draw out the toxins & pollution from your skin & exfoliate away any dead skin cells & built up residue. The botanical oils in this scrub moisturize your skin & help to carry the detoxifying power of antioxidants & essential oils through the deeper dermal layers of your skin to benefit your entire body’s well-being. The Beutisa Detoxifying Scrub works in different ways. Natural Skin Whitening oils gives you a lighter, softer and healthier looking skin. Beutisa Olive Facial Scrub is formulated to draw out the toxins & pollution from your skin & exfoliate away any dead skin cells & built up residue. The botanical oils in this scrub moisturize your skin & help to carry the detoxifying power of antioxidants & essential oils through the deeper dermal layers of your skin to benefit your entire body’s well-being. 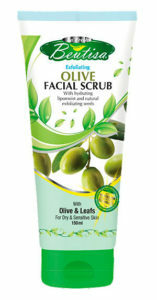 Olive Leaf Extracts exfoliate your skin to break up the trapped dirt and dead skin cells. The Organic Face Scrub is formulated to deliver effective skin exfoliation by gently removing skin impurities. Olives provide your skin with a daily infusion of natural moisturizers to keep your skin felling fresh and young all day long. Whitening Body Lotion has been specially developed to use both day and night to help your skin maintain its natural moisture balance. Formulated with special moisturizing ingredients, This Lotion is easily absorbed and non greasy to leave your skin feeling soft and silky smooth. Supports the skin’s natural balance providing a light, fresh scent. Beutisa Firming Body Lotion has been specially developed to use both day and night to help your skin maintain its natural moisture balance. Formulated with special moisturizing ingredients, This Lotion is easily absorbed and non-greasy to leave your skin feeling soft and silky smooth. Beutisa Whitening Night Cream has been formulated to whiten, nourish and regenerate your skin. Our formula is one of the most effective and efficient triple-strength whitening cream on the market. Its strong whitening formula gradually lightens your skin while you sleep. With regular use, it will gradually eliminate dark and uneven pigmentation, equalize skin tones, and brighten complexion. Wake up to soft and beautiful skin every day. Nourishes your skin during the night. Indulge your senses while whitening & softening your skin. Active ingredients lighten your skin tone. Absorbs quickly with its non-greasy texture. Beutisa Make up Remover & Cleanser has been formulated to remove even the heaviest make-up while gently cleansing your skin. With daily cleansing, dark and uneven pigmentation, freckles, and age spots will gradually become lighter and complexion will radiate with natural beauty. Dull, lifeless skin begins to glow and look youthful and fresh. Whitaderm Skin Whitening Technology make-up remover & cleanser With Rose & Chamomile. Refreshing cream removes excess oil and make-up. Whitaderm Technology Lightens uneven pigmentation, freckles and age spots. Leaves your skin feeling refreshed and silky. Won’t make your skin feel dry or tight. Safe for use around the eyes. Beutisa Whitening Face Wash has been formulated with Pro-Vitamin B3 and a blend of natural plant extracts such as citrus fruits to wash away impurities and deeply clean pores. Dark and uneven pigmentation, freckles, and age spots will gradually become lighter with our Whitaderm Technology giving you a brighter complexion with natural beauty. Dull lifeless skin begins to glow and look youthful and fresh within days. Transforms your complexion to a fair, pinkish white glow. Cleanses deeply, right down to the pores. Removes dullness and brightens skin. Washes away old and dead skin cells. With Whitaderm skin whitening technology face wash anti-bacterial. 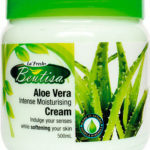 Beutisa Aloe Vera Cream is an effective moisturizer which contains 100% natural Aloe Vera extracts. Our cream penetrates the skin to moisturize from within and aids in firming the skin`s texture and tone. Our quick absorbing formula helps replenish lost moisture leaving your skin feeling soft and silky smooth. Formulated with special moisturizing ingredients, This Lotion is easily absorbed and non-greasy to leave your skin feeling soft and silky smooth. Pure & Natural Lotion has been specially developed to use both day and night to help your skin maintain its natural moisture balance. Pure & Natural Lotion has been specially developed to use both day and night to help your skin maintain its natural moisture balance. Softens and smooth’s the skin. This botanically rich, non-greasy daily lotion delivers deep, long-lasting hydration. Aloe Vera Gel instantly relieves discomforts of dry, irritated or sun damaged skin. Beutisa Firming clay mask has a high concentration of herbal elements that cleanses deeply, absorbs impurities, and controls excess oil while detoxifying skin to its very depths. With all that gunk gone, skin absorbs moisture more efficiently. This special mud tightens crater sized pores too, leaving skin feeling unbelievably soft and radiant. Volcanic Mud Masque is a high performance treatment for dull and tired skin of all types. It draws out impurities as it cleanses, and renews firmness and elasticity to the skin’s surface. This special mud tightens crater sized pores too, leaving skin feeling unbelievably soft and radiant. Indulge your senses while softening your skin. 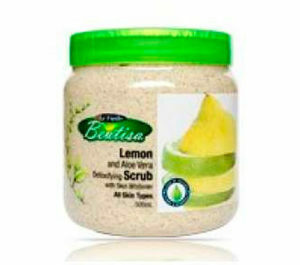 Beutisa Lemon Facial Mask Re-energizes your skin with natural and freshly squeezed juice from Sicilian lemons. A pore cleansing detox which helps remove dead skin cells to reveal a deep cleansed, toned and radiant complexion. This Clarifying mask gently peels away impurities while essential leaves your skin soft, silky and smooth. Feel the coolness on your skin and get an even tone and without glare. The high astringent capacity of the lemon helps to regulate the levels of oil and thus fight against acne, pimples or dark heads. Indulge your senses while softening your skin. Give your face a healthy glow with this fruity mask, Berries are high in anti-oxidants which means they’re great for your skin. Brighten your complexion with fresh, feel-good, Beutisa peel of mask that reveals clear, glowing skin. Keep your face radiant with Mix berry scrub. Indulge your senses while softening your skin. A super-cooling, skin-quenching mask that gently peels away impurities that can cause skin to be rough and dull. Contains Cucumber Extract to soothe while moisturizing, ensuring skin feels soft and silky-smooth after every use. Perfect for normal to combination skin. Indulge your senses while softening your skin. Beutisa Papaya peel of mask is the right one for you. Containing antibacterial properties of papaya which will kill off acne causing bacteria and germs from the skin. Papaya also has a deep cleansing action which will push out all the gunk from clogged up pores. Promotes skin renewal and regeneration. Lightens skin tones and decreases pigmentation. Acts as a skin softener which smoothens out rough skin and clears acne. Beutisa Volcanic Mud & Vitamin E has a high concentration of herbal elements that cleanses deeply, absorb impurities, and control excess oil while detoxifying skin to its very depths. With all that gunk gone, skin absorbs moisture more efficiently. This special mud tightens crater sized pores too, leaving skin feeling unbelievably soft and radiant.